The Pearls of Long Bay are the gems of Providenciales. Each home has a theater-style media room, two pools, tons of outdoor space, and ultra chic decor. 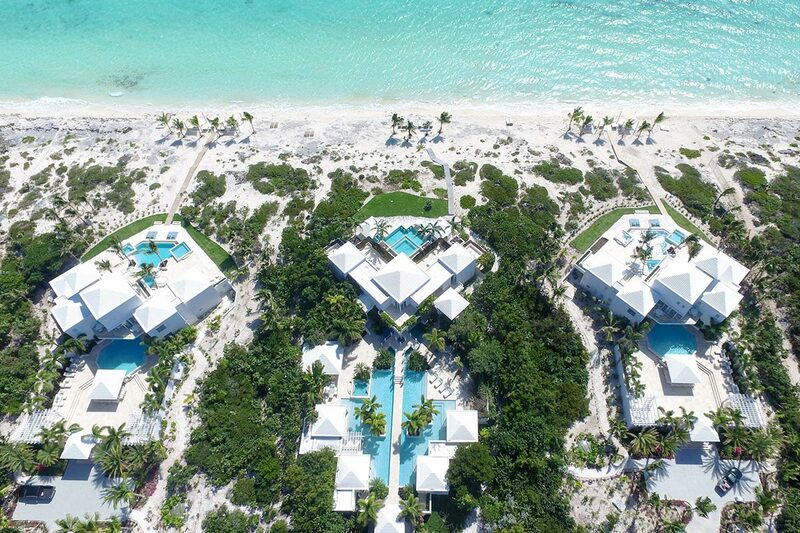 The Estate is steps from Long Bay, which is one of my favorite beaches on Turks and Caicos. Plus, Grace Bay is minutes away. This property has everything you could possibly want in a luxury vacation rental, like a chef, housekeeper, water sports, tennis, gym, and the latest technology. Beachfront Estate offering magnificent views and 5 star amenities! The Pearls of Long Bay Estate is made up of three expansive homes with five star amenities and a full staff. This gated estate is on Long Bay Beach, one of the island’s most beautiful, peaceful areas. Each villa features beautifully landscaped gardens, private pools, and lounging decks. Workout in the state of the art 1,000 square foot gymnasium or get together for some tennis on the championship court. Create a personal resort experience and relax in the Turkish steam bath, sauna, and al fresco massage pavilion. Enjoy cocktails in the poolside cabana or relax in the swing sofas below. Altogether, the estate has six pools, three hot tubs, and three children’s wading pools. There’s even Japanese teppanyaki cooking stations and BBQs at each villa. Sound systems throughout make any day a party, and children’s play sets keep little ones entertained while adults relax. A wooden boardwalk leads down to the beach’s shaded daybeds, kayaks, and oversized loungers. Onsite tennis is perfect for friendly competition. Each home’s outdoor space is multileveled and expansive, so there’s hardly any need to ever go inside. The interiors are fully air-conditioned and accented with chic, modern decor. Each villa has a luxurious media room with plush theater seating, dimmed lights, and large projector screens. There are Apple TVs and BluRay players throughout each home, in the living rooms, bedrooms, and media rooms. The kitchens are all fully-equipped with the latest appliances, and there are several indoor and outdoor dining areas. Each of the 23 bedrooms features luxurious floor-to-ceiling windows, ensuite bathrooms, and sofas at the foot of the bed. Some suites open to the swimming pool, and all have stunning views. Each villa has six king suites. Pearl West and Pearl East both have two suites with two double beds, and Lidia House has a bedroom with two twin beds. The Pearls of Long Bay Estate is only a few steps from Long Bay Beach and 3 miles away from Grace Bay. Drive to restaurants, shops, and groceries in 5-10 minutes, or stay at the estate and let the private chef prepare meals. Daily housekeeping and a laundress will alleviate any burdens, so all that’s left to do is relax. Upon arrival at the airport the guests will be met by a greeter and transferred to the villa. Car rental, server, grocery and beverage shopping (pre-arrival and during your stay), liquor and wine delivery, nanny service, baby equipment, spa services, yoga and personal training, and photography, can be arranged for an additional fee. -Subject to availability and may not be combined with other offers. Good for stays from Mar 26, 2019 to May 31, 2019.